The winner of the 2018 School on the Move Prize is…. Congratulations to the Donald McKay K-8 School, the winner of the 2018 School on the Move Prize! In recognition of the school’s dramatic improvement, the McKay received a $100,000 prize, public recognition, and the chance to share its improvement strategies with others. Check out the story in today’s Boston Globe and on WBUR to learn more about the McKay. At the 800-student Donald McKay K-8 School in East Boston, a focus on the engagement of students, teachers, and families drives the culture of “voice and choice.” The McKay credits its improvement to empowering teachers as leaders and experts; a focus on building trust among teachers, students, and families; and meeting the academic and social-emotional needs of its English learners who make up a majority of the school’s population. At the Oliver Hazard Perry K-8 School in South Boston, a sense of shared ownership and commitment to continuous improvement sets the tone for a positive, supportive, and accountable culture. As a small school serving 250 students, the Perry credits its improvement to strategically using its key resources of people, time, and culture to drive improvement; meeting students where they are by providing targeted small-group support; and creating ample opportunities for teachers to collaborate and learn from their peers. The 500-student Muriel S. Snowden International High School, located across three buildings in the Back Bay, engages students in a rigorous and global-minded learning experience. Snowden High School credits its improvement to creating multi-dimensional systems of support for students; empowering teacher leaders to experiment and learn together; and building a strong school community and culture. Through the Prize selection process, EdVestors seeks to understand how and why certain schools are able to accelerate student achievement. Each fall, EdVestors engages a select panel of civic and business leaders to dive deep into the stories of these rapidly improving schools and select one $100,000 winner and two finalists each year. Through a case study of the winning school and incorporating what we learn into the rest of our work, we help more schools make significant progress to improve education outcomes for all students. The School on the Move Prize is presented each fall at a breakfast event that draws close to 300 guests and is an inspiring reminder of the hard work and innovation that can improve schools. 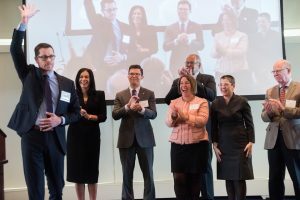 The Prize is awarded in front of an audience of Boston’s leaders in education, the nonprofit sector, philanthropy, and business. See the 2018 School on the Move Program Book for more information on the Ceremony and the Prize. Each spring, EdVestors invites a select group of Boston public schools to apply for the School on the Move Prize based on a rigorous quantitative screen of student achievement using historical and current state standardized assessment data. The criteria identify schools with improvement that is substantially higher than their peers’ in one or both core subjects (English Language Arts and Math), as compared to BPS schools serving similar grades, with additional criteria related to school performance, student demographics, and graduation rates for high schools. Typically, only 5-10% of schools each year meet the eligibility criteria and receive invitations to apply for the Prize. Invited schools are asked to prepare a written Prize application that details how they achieved dramatic improvement and outlines the strategies and best practices they employed. EdVestors’ Prize Selection Panel reviews applications and conducts site visits before announcing the winner at our annual Prize Ceremony. School on the Move Prize applications are accepted from Boston Public Schools by invitation only. NOTE: Only those schools meeting all the criteria are invited to apply each year. One former School on the Move winner, the Phineas Bates Elementary School (2016), met all screening criteria but Prize winners are not eligible to apply for five years after their win. The halls of the Phineas Bates Elementary School buzz with activity. Students hustle with instruments to music class. Leaders and teachers greet each student by name. Two students lead the school in the Pledge of Allegiance in English and Spanish. 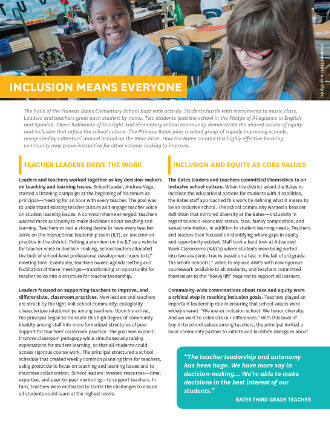 These hallmarks of this tight-knit elementary school community demonstrate the shared values of equity and inclusion that infuse the school culture. The Phineas Bates joins a select group of rapidly improving schools, recognized by EdVestors’ annual School on the Move Prize. How the Bates created this highly effective learning community may prove instructive for other schools looking to improve. Take a peek inside the Phineas Bates Elementary School to see the best practices in action.